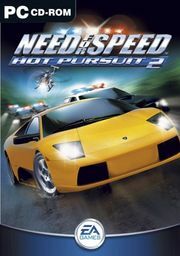 [[Need for Speed]], the award-winning arcade racing game, is back and better than ever in '''Need For Speed Hot Pursuit 2'''! *Different car modelling and versions of cars. * Different car modelling and versions of cars. *Different tracks, and large differences in track design. * Different tracks, and large differences in track design. * Different physics model and handling characteristics. * Different menu system and in-game HUD interface. * Different features, such as the PS2 'Zone Camera' system. *Quick Race - ''"Go straight into the action!"'' - Here you can jump straight into a pursuit in a random car on a random track. *You're The Cop - ''"Fill your ticket quota for big points!"'' - In this mode you drive the cop car and need to apprehend speeding drivers. *Challenge - ''"One-player and two-player challenges."'' - Set up a custom pursuit with the car, track, opposition and options of your choice. *[[Need for Speed Hot Pursuit 2 Events|Ultimate Racer]] - ''"Beat the heat in 30 events."'' - The Hot Pursuit Career mode consisting of a tree of over 30 pursuit events. *Quick Race - ''"Go straight to the action!"'' - Jump straight into a race in a random car and track. *Challenge - ''"One-player and two-player challenges."'' - Customise and race with the car, track, opponents and options as you want them. *[[Need for Speed Hot Pursuit 2 Events|Championship]] - ''"Real cars, real fast in 30 events."'' - The World Racing career mode consisting of a tree of over 30 racing events.